ChessBomb Blog: Veselin Topalov: "I have almost no chances for the world title"
Veselin Topalov: "I have almost no chances for the world title"
Original interview in Bulgarian from Dnevnik. English translation by ChessBomb. Bulgarian GM Veselin Topalov won the super-tournament in Stavanger, but despite the big success he is aware of his mistakes. In an interview for "Dnevnik", the man from Ruse admits that luck was a factor, and that in some games he didn't play well. He has not decided yet if he is going to fight for the world crown. 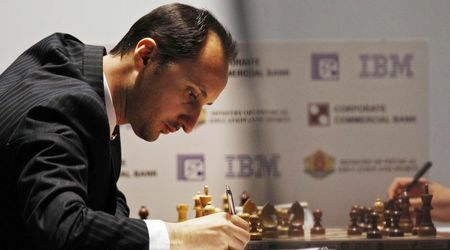 Mr Topalov, congratulations for the victory. What are your impressions from the tournament? For 4-5 days I was comfortably in the lead, and got accustomed to being close to victory. The first days were full of action. I achieved very good wins, playing well in some games. Against Aronian for example, my play was very strong. It's true that my opponents made blunders, but that wasn't my concern. Altogether my score is good, as I had not played since February. And I had great luck in the game against Carlsen. What exactly happened in that game? The fault was joint - his own, and to some extent the organizers`. His own, because he was late for the game, it being the first round of the tournament. At the start, the arbiter explained the rules, pointing at the time control, which was different than the usual. Even during the game, I myself asked about the time, and she confirmed. But Carlsen missed these instructions. Such a mistake happens once in your career, but it happens. How much did that first win help you in the next rounds? This was just one round, it wasn't decisive. Carlsen could have made up for the loss in the following rounds, but he kept playing worse than usual. I myself was quite disappointed with my own play, I didn't deserve that win. After you play so poorly, you cannot enjoy being the winner. Carlsen outplayed me out of nothing. And one win does not solve your problems. Afterwards though I played well. In the end there was the decisive game against Anand, in which he had to take a great risk for the chance to win. But for him the second place was good as well, because he can still attack the top in the Grand Chess Tour. This is the first super-tournament that you win, since Linares 2010. What is the balance-sheet? This victory alone is not too significant. Truthfully, I won with half or one point more than I actually deserved. The success is big, but not the biggest in my career. The feeling is good, but I don't have the ambition to win the Grand Chess Tour. There is still one tournament in USA in August, and one in London in December. I'll be happy if I make it in the top 3 in the final standings. Will you fight for the world crown? The present success changes nothing in the long term. I'll probably qualify for the Candidates Tournament, but winning it will be very difficult. I'm not yet certain if I'll agree to participate, because there are things in FIDE I don't like. It's not yet clear where that tournament will be held, or what the prize fund will be. So far Anand, Caruana, and Nakamura have qualified, and five more places remain. It's not impossible for me to win it. But looking objectively, afterwards in a match for the world title against a young player such as Carlsen I have almost no chances. Out of ten factors, he outmatches me in eight or nine. Now we'll see how much time I'll have for preparation, because it's not easy when you have a child.